Jinqiao Economic and Technological Development Zone of the China (Shanghai) Pilot Free Trade Zone (SHFTZ) has a total area of 20.48 square kilometers, stretching to Outer-ring Road Green belt to the east, East Jinxiu Road to the south, Yanggao Road to the west, and Jufeng Road to the north. Jinqiao area serves as an important core functional zone for advanced manufacturing industry, production-oriented service industries and emerging strategic industries in Shanghai, and also as a national demonstration zone for ecological industries. Jinqiao will innovate governance management and financial systems, foster a business environment for trade facilitation and develop emerging strategic industries which are globally competitive. It will continue to improve the dynamism and innovation capacity of its economy. The Administrative Committee of Jinqiao Economic and Technological Development Zone, as an agency of Pudong New Area People's Government, actively implements the policy of "innovation-driven and transformation development" and coordinates the economic growth of Jinqiao Economic and Technological Development Zone, Jinqiao Economic and Technological Development Zone (South Park) and Nanhui Industrial Park. It earnestly fulfills the function of providing services to economy, projects and enterprises and focuses on cooperation and the integration of resources among the parks, promoting the sustainable development for the zone and continuously enhancing its growth potential. In 2010, the Jinqiao Economic and Technological Development Zone, Jinqiao Economic and Technological Development Zone (South Park) and Nanhui Industrial Park gained positive momentum of economic growth and various economic indicators achieved rapid growth year-on-year and set a record high. Jinqiao Economic and Technological Development Zone and Nanhui Industrial Park achieved a total industrial value of 218.813 billion yuan ($34.1 billion), contracted foreign investment of 738 million U.S. dollars, actual received foreign investment of 314 million U.S. dollars, domestic registered capital of 1.643 billion yuan, tax revenue of 8.361 billion yuan, local fiscal revenue of 2.095 billion yuan and fixed-assets investment of 7.51 billion. Pudong Airport Industrial Park has registered a total value of the industrial enterprises above designated size of 16.438 billion yuan, contracted foreign investment of 245 million U.S. dollars, actual received foreign investment of 255 million U.S. dollars, domestic registered capital of 1.034 billion U.S. dollars, tax revenue of 1.111 billion yuan, and fixed-asset investment of 2.488 billion yuan. Zhangjiang High-Tech Park (hereinafter referred to as the Zhangjiang Park), founded in 1992, is one of the major state-level high-tech industrial development zones. Since Shanghai Municipal Party Committee and Municipal Government made a strategic decision of "focus on Zhangjiang" in 1999, Zhangjiang Park has entered a stage of rapid development. In 2010, Kangqiao Industrial Park and International Medical Zone were included into Zhangjiang Park; in 2012, Zhoupu Fanrong Industrial Area was included. Zhangjiang Park covers an area of 79.9 square km, with 40 square km of Core Area, 26.88 square km of Kangqiao Industrial Park, 11.78 square km of International Medical Zone and 3.77 square km of Zhoupu Fanrong Industrial Area. The State Council included the 37.2-square-kilometer Zhangjiang Park into Shanghai Pilot Free Trade Zone on December 29, 2014, bringing the Park a new round of opportunities for development. Zhangjiang Park stretches to the Outer Ring Road and Shenjiang Road to the east, Outer Ring Road to the south, Luoshan Road to the west and Longdong Avenue to the north. Zhangjiang Park is located in the center of Pudong New Area, adjacent to Lujiazui Financial and Trade Zone and Shanghai Disneyland. It’s a 15-minute drive from Shanghai Pudong International Airport. The park is adjacent to the Inner Ring Road of Shanghai and is located in the major trafic arteries such as the Central Ring Road, Outer Ring Road, Luoshan Road, and Longdong Avenue. The metro network in Zhangjiang Park consists of three horizontal lines and two vertical ones, including the Metro Line 2, and the Metro line 11, 13, 18 and 21 that are under construction and a Disneyland feeder line. More than 10,000 enterprises have registered in Zhangjiang Park and leading industries include information technology, biomedicine, cultural creativity, and low-carbon and environmental protection industries, two thirds of whom are tertiary industries. Information Technology (IT) Industry: It mainly includes integrated circuit, software and IT service, optoelectronics and consumer electronics terminal industries, etc. The integrated circuit industry has formed a complete industrial chain including design, manufacturing, packaging, testing, and equipment and materials, and its output accounts for one third of that of the whole country. The software industry has also gathered a large number of well-known software companies and R&D institutions at home and abroad, including Baosight Software, Citigroup Inc. from the USA, INFOSYS and TATA from India, etc. Eight of them are among the world’s top 30 software industries, and 11 of China's Top 100 software industries have set up R&D centers in Zhangjiang Park. Bio-pharmaceutical Industry: A complete innovation chain has been formed including new drug development, drug screening, clinical research, pilot plant scale-up, registration and certification, and mass-marketing. The park has developed more than 230 new drug products and acquired more than 50 new drug certificates. Currently, nearly 300 drug products are being developed. Seven of the world’s top 10 pharmaceutical companies have set up R&D centers in Zhangjiang Park (such as Roche, Pfizer, and Novartis) and more than 400 related R&D institutes and over 40 CRO companies have settled in the park. Cultural and Creative Industries: With the industrial characteristics of digital publishing, animation, film and television, online games and creative design, the park has gathered a large number of domestic and foreign outstanding cultural and creative enterprises such as Shanda Literature, Hyundai Cartoon, Blizzard Entertainment, Electronic Arts, Juli Media, Hujiang Network, Hippo Animation. In 2008, Zhangjiang Cultural Industry Park was officially named China’s first state-level digital publishing base by the State General Administration of Press and Publication. In 2011, it was officially named the international cultural industry demonstration park by the Ministry of Culture. Low-carbon and Environmental Protection Industry: The park gives priority to the development of the businesses of smart grids, water treatment, biofuels, biological desulphurization, the R&D of energy-saving and environmental protection equipment and environmental protection services. Enterprises such as Lin Yang Electronics and e-Cube Energy develop rapidly. In addition, as Shanghai is building a Global Science and Technology Innovation Center, Zhangjiang Park strives to foster an entrepreneurship base for "four new" economy (new technologies, new industries, new models and new businesses), develop and introduce a group of relevant enterprises. The park is accelerating the aggregate development for those enterprises, making Zhangjiang become a source and gathering place for the development of “four new” economy. Innovation resources continue to converge in Zhangjiang Park. The park is home to 403 R&D institutions at the national, municipal, and district levels, and to a number of major scientific research platforms such as the Shanghai Synchrotron Radiation Facility, Shanghai Supercomputer Center, Shanghai Aircraft Design and Research Institute of COMAC and Zhangjiang Medicine Valley Public Service Platform. It also has nearly 20 universities and research institutes, such as Shanghai University of Science and Technology, Shanghai Advanced Research Institute of Chinese Academy of Sciences, Shanghai University of Traditional Chinese Medicine, Fudan University Zhangjiang Campus, providing research results, technical support, and talents for the development of enterprises in the park. Science and technology-based finance continues to develop. Zhangjiang Park has gathered 20 banking financial institutions and 34 venture capital institutions. The park has helped 28 companies listed, 25 enterprises listed on the New Third Board, and 19 companies listed in Shanghai Equity Exchange. It has successively launched products like incubator loans, SEE loans, reciprocal loans, innovation fund loans, " Collective Trust for Zhangjiang's SMEs", Zhangjiang SMEs Collectible Notes, and Technology Cards, in an effort to address the financing difficulties for SMEs. High-level talents continue to flow in. There are nearly 350,000 employees in Zhangjiang Park, 56 percent of whom hold a college degree or higher. More than 5,500 employees have a PhD degree and nearly 40,000 have a master's degree. The park has 96 talents from the national "Thousand Talents Plan", 92 from the "Thousand Talents Plan" of Shanghai, 15 leading talents of Shanghai and around 7,600 overseas returnees and foreigners. There emerged a number of leaders for independent innovation, such as Wu Ping, Chang Zhaohua, Yu Gang and Chen Tianqiao. Reforms and innovations are further advanced. Taking Pudong's comprehensive supporting reforms as an opportunity, the Zhangjiang Park adopted ten policies for innovation and made breakthroughs in innovation in the fields of equity-based incentives, state-owned venture capital, fiscal and tax support and talent accumulation. It has further promoted the pilot projects of CMO and reform on the bonded supervision over integrated circuits, pushed the construction of the air service center in the park, deepened the reform on the examination and approval system in Zhangjiang and advanced the "secondary development" of Zhangjiang's land and the transformation of the land used for industrial purposes. The park has built a credit system for Zhangjiang, and it will strive for more pilot reform projects. The overall environment continues to optimize. The public transport infrastructure such as the metro, buses, and trams continues to improve. The park has built such business areas as Legend Square, Changtai Plaza, and Huizhi Life Center and renovated the 40,000-square-meter Nobel Lake Park and built the Zhangjiang Sports Leisure Center. Intensified efforts has been made in the construction of talent apartments and a "two 1000s" policy has been introduced, namely, the monthly living cost per person is 1,000 yuan and the monthly rent for offices is 1,000 yuan. The park strives to create a comprehensive environment for development with convenient living facilities, a beautiful environment, good services and a comfortable life. China (Shanghai) Pilot Free Trade Zone (FTZ) Bonded Area consists of Waigaoqiao Free Trade Zone, Waigaoqiao Free Trade Logistics Park, Yangshan Free Trade Port Area and Pudong Airport Free Trade Zone, occupying a total ground of 28.78 square kilometers. Waigaoqiao Free Trade Zone, founded in 1990, is the first bonded area in China under the supervision of Shanghai Customs; Waigaoqiao Free Trade Logistics Park, established in 2004, is also the first bonded logistics park in China; Yangshan Free Trade Port Area, opened in 2005, is the first bonded port area in China; Pudong Airport Free Trade Zone, set up in 2009, integrates bonded logistics and air cargo area. Waigaoqiao Free Trade Zone, the first bonded area in China, is founded in June 1990 upon the approval of the State Council. Occupying some ground of 10 square kilometers, it has developed into a special area with large economic scale and complete business functions that is under the supervision of Shanghai Customs. As the the first "National Promotion and Innovation Demonstration Area of Import and Export Trade" in China, the zone is a trade platform for ten major fields – alcohol, clocks and watches, automobile, construction machinery, machine tools, medical equipment, biological medicine, health product, cosmetics, and cultural products. It is also designated as China first "National Base for International Cultural Trade" by National Culture and Tourism of the People's Republic of China. Waigaoqiao Free Trade Logistics Park, the first bonded logistics park, is founded in December 2003 upon the approval of the State Council. It occupies some ground of 1.03 square kilometers. As the first pilot zone-port interactive area, it can both enjoy the sea transportation resources of Shanghai Port and the preferential policies for bonded area and export processing zone. Supported by Waigaoqiao Free Trade Zone, it is a major base for the development of modern international logistics industry. Yangshan Free Trade Port Area, the first bonded port in China, is founded in June 2005 upon the approval from the State Council. Occupying some ground of 14.16 square kilometers, the area is comprised of Little Yangshan Port area, land area and the Donghai Bridge that links them together. Acting as an integration of port and bonded area, the area is the major undertaker of Shanghai international shipping. It is home to the distribution centers for electronic products, vehicles and auto parts, luxury food, and brand clothing. It has developed into a distribution base for Europe and the United States, an industrial base of staple commodity, an import trade base for domestic market, and a gathering place for leading shipping enterprises. 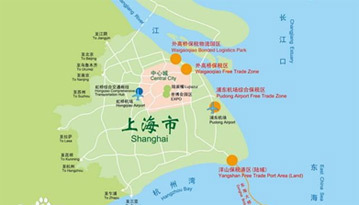 Pudong Airport Free Trade Zone, occupying some ground of 3.59 square kilometers, is founded upon the approval the State Council in July 2009. It undertakes the functions of bonded logistics and airport freight transportation and acts as a pioneering area for airport service industries. It is home to the distribution centers for well-known multinational corporations that deal with electronic products, medical equipment, and luxury customer goods. Hundreds of financing and lease projects, worldwide express package service companies UPS, DHL and FedEx, and a batch of functional projects also operate in the zone. An industry chain covering the fields of air distribution center of Asian-Pacific region, financing and lease, express transshipment center, sales exhibition of luxury customer goods is also established in the zone. Based on its original industrial resources, FTZ plans to boost the development of five major industries – international trade, financial service, shipping service, professional service and high-end manufacturing, and prioritize the development of headquarters economy, platform economy and economies featuring new technology, new industry, new form and new model. Waigaoqiao Free Trade Zone is defined as a comprehensive functional zone which centers on international trade, financial and professional services and integrates the functions of business, commerce, culture and entertainment; Waigaoqiao Free Trade Logistics Park will develop into a functional area featuring international logistics services based on Waigaoqiao port area and Waigaoqiao Free Trade Zone; Yangshan Free Trade Port Area is about to become a functional area of international shipping services and offshore services by making good use of the channel conditions of Yangshan deepwater port and the preferential policies for FTZ; Pudong Airport Free Trade Zone will become a functional area of international air service and modern commerce and trade based on Shanghai Pudong International Airport and by cooperating with nearby resort areas.